Take a microwave safe bowl which is easy to handle. In the bowl add ghee and mix vanaspati. Place this ghee-vanaspati mixture bowl in microwave oven and heat on high power for 10 to 15 seconds or till the mixture is hot. Take a cake tin and smear ghee in the inner sides and bottom. Place a pan on the gas stove on low flame. Cooking of this dish is done entirely on low flame only. Add water and sugar to the pan. Cook the sugar solution stirring till it reaches one thread consistency. When sugar solution starts boiling place the candy thermometer and cook it reaches 110oC. When the syrup reaches one thread consistency (110oC) add gram flour and mix well. Mix the gram flour till there are no lumps. Cook the mixture till it becomes somewhat thick. Meanwhile heat the ghee mixture in microwave oven on high power for 10 to 15 seconds. When the gram flour starts thickening add some ghee mixture and keep stirring till all the ghee is absorbed by the gram flour-sugar mixture. Keep stirring the mixture all the while. The gram flour while getting cooked smells raw. We need to add ghee and fry till the raw smell of gram flour vanishes and a nice aroma fills the space. Mean while heat the ghee mixture in microwave oven on high power for 10 to 15 seconds once again. When all the ghee is incorporated into the gram flour mixture, add some ghee mixture and mix again. Wait till all the ghee is absorbed. Now repeat the process of heating and adding some of the ghee mixture to the gram flour mixture. In this process the gram flour gets cooked in the sugar syrup and gets fried in the ghee mixture. At one stage the gram flour mixture will not absorb any more ghee. By this time the raw smell of the gram flour also vanishes giving a nice aroma of fried gram flour. The color of the gram flour mixture also changes slightly. Now work fast from this stage. At this stage immediately take the pan off the flame and transfer the mixture to the prepared cake tin. Spread evenly with the flat ladle and leave it aside till all the ghee is absorbed. Once all the ghee is absorbed immediately cut into desired shapes within the cake tin. Leave this marked mixture aside to cool completely.When the mixture is cool turn it into a plate and break near the cut marks to separate the pieces. When we observe a piece, we find the middle portion of the piece is slightly darker than the top and bottom portions. The heat inside the mixture is the reason for the change in color in the middle portion. The mysore pak is ready to serve. Take good quality gram flour which is free of germs. Vanaspati or hydrogenated oil (Oil not known many times !!) may be replaced with ghee or oil. Vanaspati does not have any flavor so it will not smell bad after some time. If we use ghee instead of vanaspati the mysore pak tastes rich. But due to the strong smell of ghee it will give a feeling of nausea and one will be restricted to eat very less. If we replace oil with vanaspati, after few days the mysore pak will taste oily. 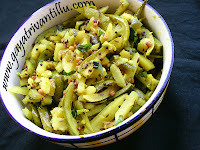 So it is better to use vanaspati and ghee combination for taste as well as less rich feeling. One can even prepare the dish entirely with vanaspati, but as we all know vanaspati is not good for health as it is hydrogenated oil and contains lot of fat. Always use melted ghee and melted vanaspati only. To test the thread consistency of sugar it is a good option to use candy thermometer. When the syrup reaches 110oC on the candy thermometer, the sugar syrup reaches one thread consistency. The process which takes place in Mysore Pak preparation is, gram flour gets cooked in sugar solution and it gets fried in the ghee mixture. Cooking and frying removes the raw smell of gram flour. Frying also makes the gram flour light and fluffy. The more fluffy the gram flour becomes we find more holes in the mysore pak. At a stage the gram flour mixture becomes fluffy and appears like soap bubbles and it slightly changes color. At this stage we can also observe that the raw smell of gram flour vanishes and the mixture is not ready to take any more ghee.Then immediately transfer the mixture to the prepared tin and spread. If we leisurely do this transferring job, the mixture becomes hard and will not get the desired shape—then we have to consume it in powder form. So work fast and do not waste time on scraping the vessel while emptying it into the cake tin. Cutting the Mysore Pak to pieces while it is still warm is once again more important—otherwise the mixture hardens and will not break evenly afterwards. Mysore Pak making will become a success when the middle portion of it changes color and gets red tinge. The top portion of the mysore pak gets cooled as it is in open and the bottom portion gets cooled as the surface of the cake tin is touching the ground. The middle portion of the mysore pak gets cooked further with the heat retained in between and gets a red tinge. Do not be tempted to cook on high flame. The entire process will be finished within half an hour—so be patient and the dish will come out excellently. For those who are not having microwave oven, heat the ghee mixture on another gas burner. Gas flame heat is retained for a longer period due to the vessel heat — so it will not be necessary to heat before every addition. Think scientifically and act accordingly. Do not add all the ghee mixture at one go. Initially add around one-fourth of the ghee mixture taken. For the next addition also add one-fourth of the remaining ghee. Later on add little by little. When the gram flour mixture starts becoming foamy, add ghee mixture little by little only. For me in this recipe only 180gms of ghee mixture was sufficient on the whole. But to be on safe side take a little bit more. oil mixture was taken. Mysore Pak making, as all think, is not difficult. It is a dish to be prepared patiently to enjoy the great taste. your way of presentation is too good.. but i have on suggestion.. the measurements which you give in grams is not comfortable for me..can you even mention it in tablespoon/cup measurement which will be very easy to go with it. thanks so muuch for your recipes..
i don't have measuring scale but have the cups so can i get the cups version of the indgridients measurement for mysore pak Please? pretty urgent want to make it tomorrow for my daughter's vuyalla function. your presentation about mysore pak is simply excellent. liked it soooooooooooooooooooooo much. Firstly, Hats-off to your work .Your website is great and the way you present yourself(not just your recipes but everything your pronunciation,your articles, your respones ) is fantastic. We are a new couple married 4 months ago living in USA and i told her to rely on internet to learn cooking. She used to watch your videos everyday and sitting next to her , i could hear your narration but frankly never looked at your website myself until today. The reason that brought me here today is my wife prepared mysore pak learning from your video and it came out very delicious. The whole credit goes to you (but i got to give some to my wife o.w she might not cook it again :) ). Once again heartful thanks to your work. I prepared Mysore pak twice and was very tasty and unbeatable. I recommend you participate in Master chef competition. I am sure you will definetly be over the TOP. mee vantalu nenu chala try chesanu. chala baaga vachayi.Nenu me website ni me work ni real ga appreciate cheyalanipinchi e comment rasthunanu. Meru site ni chala baaga maintain chesthuranu. Totally I want to say one thing ur work is appreciative.All the best. 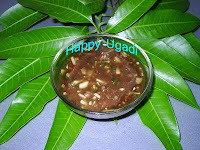 I am Sowjanya From Newjersey would like to request you for the Sweets recipe especially Cashewnuts(jeedipappu pakam). If u could send me as early as possible I would be grateful to u.
I would like to appreciate ur talent in creating and promoting the nice recipes and that too in telugu videos which are more helpful for the youth those who are living abroad particularly. Hi Gayathri, Good to know you thru this website. Most of your recipies have worked well for me. Got little upset with mysorepak, I didnt get holes,it was all like a solid block. but tasted delicious.Could you please include some more appetizers (niluva pindi vanataly especially hot) I only see sweets in your list. can you add chekodilu kind of niluva items too. Hi Hayatri, Came to know of your web site only recently. You have done a great job. My congrats to yoy. The mysore Pak did not come out well. The flour became grainy and did not absorb the ghee. 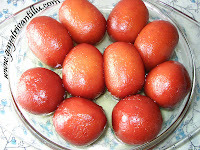 the colour also became red too soon and the final product was still soggy. What went wrong? Can you help throw some light on this.